If maximum power is required, there is no other way but the 450 XC-F. The compact SOHC (single overhead camshaft) engine that delivers explosive but controllable power shares 95% of the parts with the bike of Ryan Dungey winning the AMA Supercross championship 2015. AIRBOX: The new airbox design offers maximum protection of the air filter against soiling, while ensuring maximum airflow in conjunction with lighter intake snorkel that is made of a new material to reduce the deformation due to air intake pulse for improved performance. The new Twin Air filter is easier and safer to mount and can be changed without tools in seconds, a standard and original KTM feature. 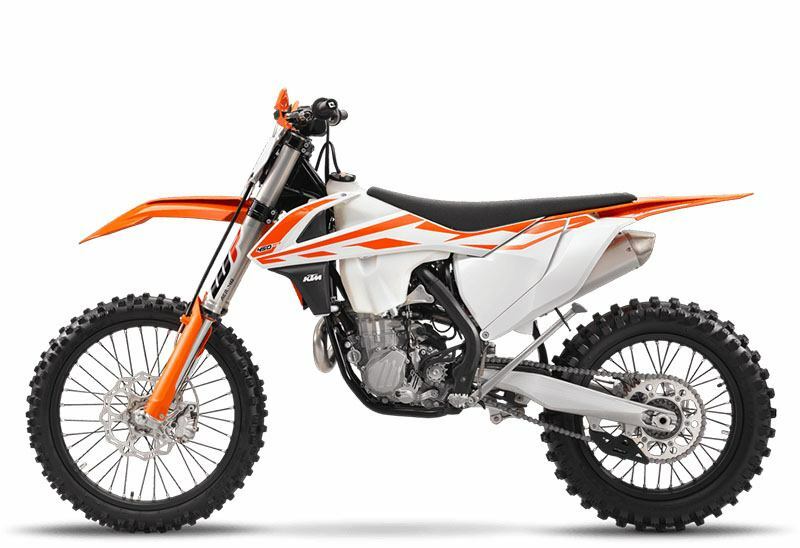 BATTERY AND WIRING HARNESS: As in the past, all new XC-F engines are fitted with the proven electric starter - a unique KTM feature and a major benefit at all levels of motocross racing. For MY 2017 the XC-F range fits a super compact and lightweight lithium-ion starter battery, providing safe starting of the engine while reducing the weight significantly. BRAKES: High-tech Brembo brakes have always been standard equipment on KTM off-road bikes, and combined with the lightweight Galfer Wave discs, they are the ultimate solution in braking technology. FOOTPEG: A new sophisticated "No-Dirt" footpeg solution prevents dirt from blocking the pegs in order to keep them in the correct position, even when dragging in deep ruts. In addition, the new footpegs are larger, lighter and more stable, providing better grip. SWINGARM: As on the predecessor models, the new XC-F generation features a reworked cast aluminum swingarm. The updated design offers reduced weight and an optimized flex behavior supporting the frame and suspension created with a single-component casting process. The weight reduction is 250 grams. BODYWORK: For the new generation of XC-F models the KTM factory riders were involved in shaping the bodywork together with the specialists from KTM R&D and Kiska Design. The goal was to achieve complete harmony between rider and bike down to the finest details. The results are all-new plastics that provide perfect ergonomics and contact points for the rider, maximum freedom of movement, a lower seat height of between 10 to 20 mm (rear end) and better comfort, especially in the rear part of the seat. GRAPHICS: New modern in-mold graphics highlight the Ready to Race character of the cutting-edge 2017 XC-F range of bikes. HANDLEBAR: The new generation XC-F models are equipped with a new tapered handlebar made of high-strength aluminum by NEKEN, which is fixed in a new rubber damped handlebar clamp allowing the handlebar to be mounted in two different positions. All 4-Stroke models feature a new throttle assembly with model-specific throttle cams for different opening characteristics and new ODI grips featuring lock-on fixing clamp on the left-hand side. MONOSHOCK: The new generation of monoshock made by WP Suspension has been developed for the new XC models in conjunction with the new frame and swingarm architecture, including the reworked linkage system and the new WP forks. The new body features a revised reservoir for a larger gas chamber to reduce performance fade. The linkage system has also been reworked with a revised geometry and longer pull rods. FORKS: The KTM XC models feature the advanced WP AER 48 for 2017. The AER 48 has been specifically designed and adapted for off-road riding conditions in the USA. TRIPLE CLAMP: Top quality, CNC-machined triple clamps have been something of a KTM trademark for years. Ensuring precise handling, they provide proper clamping force for correct flex characteristics, thus improving the action of the forks. For 2017 the upper triple clamp features a newly developed rubber damping system for the handlebar clamp in order to reduce the vibration levels felt through the handlebar. The clamps retain their forward and back adjustability for rider preference. WEIGHT REDUCTION: The main target for the KTM engineers when developing the new XC-F generation was a massive weight reduction in conjunction with improved handling. The resulting loss of nearly 8 lbs is outstanding, making the new KTM models the lightest bikes on the track, even with electric starting. ENGINE: With new features such as more compact dimensions, stronger performance throughout the rev range and a weight reduction of 4 lbs, this newly developed powerplant is the lightest 450 engine on the off-road market. With a reworked single overhead camshaft cylinder head and the latest electronic fuel injection, the 450 XC-F has unrivalled power of more than 62 hp and a highly efficient power delivery. CYLINDER HEAD: An all-new camshaft controls intake and exhaust flow through optimized ports in the newly designed cylinder head. This activates four ultra-lightweight titanium valves via extremely rigid rocker arms, which are DLC coated on the intake side. This configuration allows engine speeds of up to 11,500 rpm. In addition, the head is 350 g lighter than the previous model due to the compact design. CYLINDER HEAD AND PISTON: A new 6 mm shorter cylinder is more rigid and matched to the new cylinder head. An extremely lightweight box-in-box type piston together with a weight optimized piston pin contributed to the engine's low vibrations and quick revving character. The compression ratio is 12.75:1. CRANKSHAFT: The 450 XC-F's crankshaft features 10 % more inertia (without increasing weight) and utilizes a shorter connecting rod over the previous model, which contributes to an overall compact and light engine with a snappy power delivery. A higher balancing factor reduces the vibration level. A plain big end bearing with two force-fitted bearing shells runs directly on the crank pin, and the overall design offers the customer lengthened service intervals. COUNTER BALANCE SHAFT: The weight optimized, side-mounted counter balance shaft also time drives the water pump. Thanks to perfect mass balancing and low total oscillating mass, engine vibration is kept to a minimum even at the highest engine speeds. 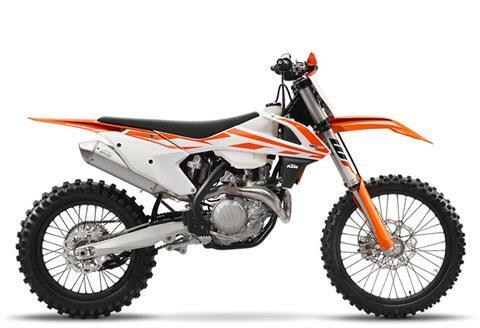 ELECTRIC STARTER: Like all KTM 4-Stroke motorcycles, the 450 XC-F is started with ease by pushing a button. Demonstrated time and time again, an electric starter can become an invaluable advantage in the heat of off-road competition. ENGINE CASES AND COVERS: The completely new design of the die-cast engine cases allows for a much more centralized shaft configuration, raising the crankshaft by 7 mm and 9 mm backwards to centralize mass and for a weight savings of 1.2 lbs. Newly designed engine covers made of magnesium feature an advanced surface structure in order to reduce the wear caused by the rider's boots. CLUTCH: The 450 XC-F employs the KTM-developed DDS clutch (Damped Diaphragm Steel) with a wear-free steel basket and extremely heat resistant clutch plates. This design is distinguished by employing a diaphragm spring instead of coil springs, which makes for a considerably easier clutch action. The diaphragm spring also leaves sufficient space for a damping system integrated into the clutch hub, which benefits for both traction and durability. TRANSMISSION: The new engine of the 450 XC-F uses a lightweight 5-speed gearbox with unchanged gear ratios that are perfectly matched to the power delivery of the large displacement engine. 1st and 5th gears are now treated with a special surface treatment for better reliability. ENGINE MANAGEMENT SYSTEM: The completely reworked Keihin Engine Management System, with electronic fuel injection, features an all-new 44 mm throttle body, which provides instantaneous response and maximum performance thanks to a revolutionary injector position. The new ECU (Engine Control Unit) includes a launch control for more efficient starts with the provision of different maps according to the gear sensor selection. In addition, the rider can activate an optional map for a different power delivery via the map select switch on the handlebar.